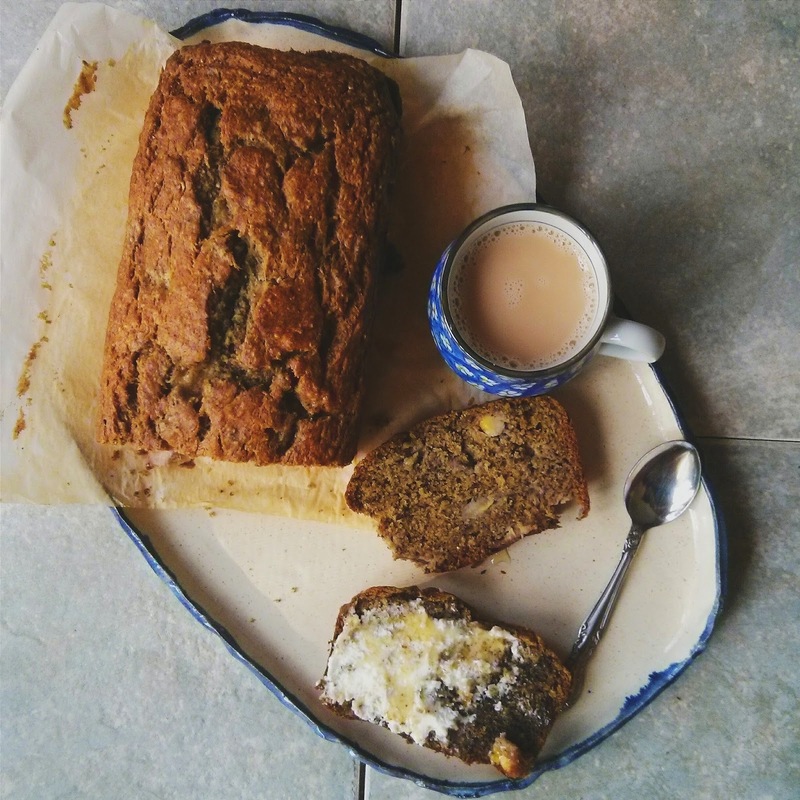 I am a banana bread freak, plain and simple. Over the years, I’ve experimented with many, many different variations, and all sorts of combinations of fat/sweetener/flours/flavours: creaming the butter, vegetable oil, coconut oil, avocado, apple sauce, greek yogurt, mascarpone, buttermilk, honey, maple syrup, coconut sugar, no sugar, peanut butter, tahini, black sesame, cherry, chocolate, almond, oat flour, spelt flour, whole wheat flour, coconut flour etc. etc. etc. I found I liked, as a base, mycupofcake’s recipe the best, but sometimes I play with the proportions so much, it’s nothing like what is written. My other standby would be Joanne Chang’s Flour’s Famous Banana Bread, which is quite popular amongst bloggers, I’d have to say. So after a trip down to Trader Joe’s, I was ready for the recipe. pull all ingredients out an hour before so they’re at room temperature! Trust me, it’s actually important….. I’ve had dairy products curdle on me, melted coconut oil that solidifed… it ain’t pretty. don’t open your oven too early during the process! leave some chunky bananas when you’re mashing them. you won’t regret this either. What did it taste like? Pretty phenomenal. 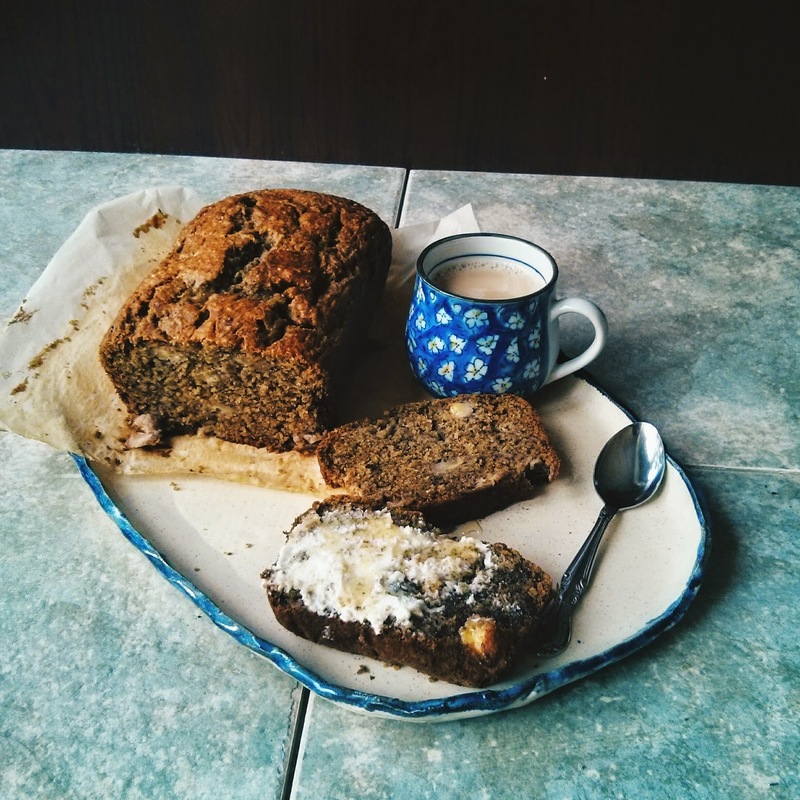 One of my favourite banana bread recipes to date, and that’s saying a lot. The black sesame lends a subtle earthiness/smokiness to the taste, the banana flavour isn’t overshadowed by tons of sugary sweetness (a benefit to cutting back on the sugar!). The loaf is moist with a nice, light crumb, due to the creaming process of the butter. A slice of this MUST be eaten with a generous spread of mascarpone and a drizzle of your best honey. Sea salt is optional, my loaf was salty enough on its own. Preheat oven to 350°F. Line a loaf pan (8.5 x 4.5″) with parchment paper, leaving an overhang on the sides. In a medium bowl, sift together the flours, baking soda, and salt. In the bowl of a stand mixer, beat together the brown sugar, mascarpone, and butter until light and fluffy, about 4 minutes on medium speed. Scrape down the sides and bottom to ensure uniformity.Add eggs one at a time, beating to blend after each addition. Scrape down the sides again.Reduce speed to low, add flour mixture, and mix until just combined. I prefer doing this by hand. Add bananas and mix just until combined. Transfer batter into prepared pan; smooth top. Bake bread until a tester inserted into the center comes out clean, 60–65 minutes. Transfer pan to a wire rack and let bread cool in pan 1 hour. Turn out bread and let cool completely. 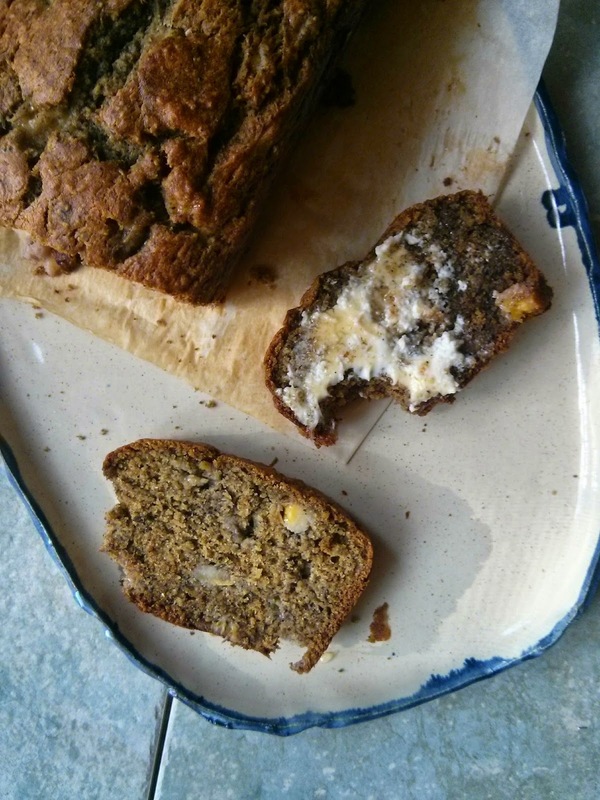 As always, banana bread tastes better the next day, after its flavors have developed in the fridge. Serve with mascarpone, a drizzle of honey, a sprinkle of sea salt.